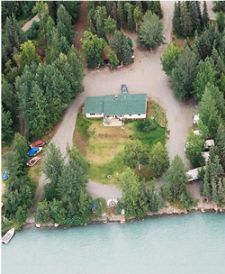 This is a "must do" if you're visiting the Kenai Peninsula between the months of May & July. 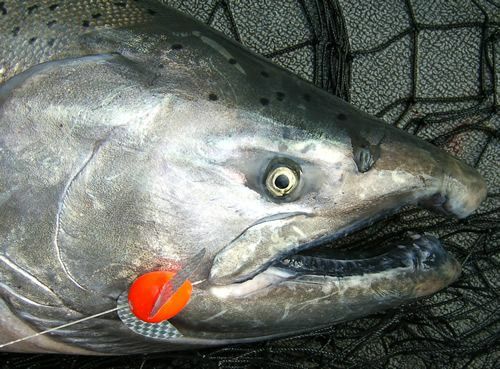 Chinook salmon (Oncorhynchus tshawytscha) are found throughout Alaska, but the world's largest King Salmon, caught in fresh water by a sport fisherman, was caught here by the Les Anderson. Les' King Salmon, weighing in at 98.4 pounds is immortalized in the Soldotna Visitor Center for generations to marvel at and dream about. 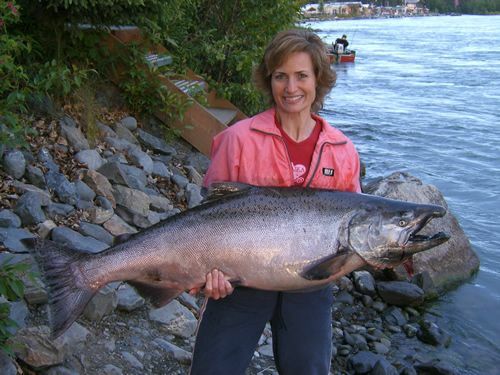 Many Kings caught each summer here on the Kenai weigh in at the plus 75 pound mark, with occassional fish hitting the 90 pound range, but many more get away, breaking the line and eluding even the most skilled fisherman. For inexperienced anglers, the best way to pursue the mighty King is with a professional guide, which there are no shortages of here on the Kenai River. For those with boating and salmon fishing experience elsewhere, we may be able to arrange a rental boat with a local provider so you can call your own shots, set your own schedule, and fish outside of the guide's hours--which are limited to Tues~Sat, 6:00am to 6:00pm. Fishing from shore for Kings is almost impossible here on the Kenai River, due to swift currents and the strength of these fish--we've seen many a line snapped by a raging King hooked inadvertently while fishing for Reds or Silvers. What to Bring: Warm clothing in layers (prepare for everything from hot sunshine to freezing rain), knee boots or hiking boots are sufficient on the boat, rain gear, sunscreen, sunglasses, lunch, drinks, fishing license/king salmon stamp, camera and a positive attitude! Where to Gear Up: Soldotna Trustworthy Hardware for basic rain gear, boots, and fishing licenses/King Stamps. Wilderness Way Sporting Goods for high end performance outerwear from top brands, protective hats, sunglasses, etc.